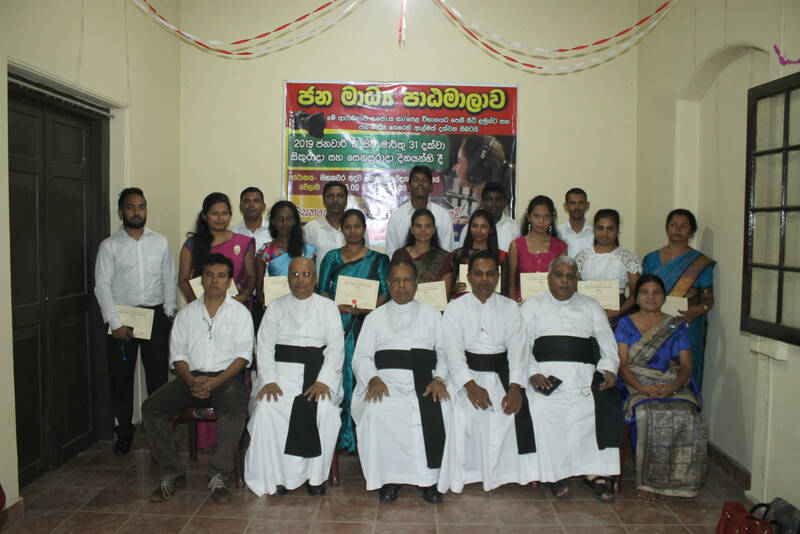 Mission Sunday is on the 22nd October and the theme given is “Witnessing Evangelization……. need of the time”. 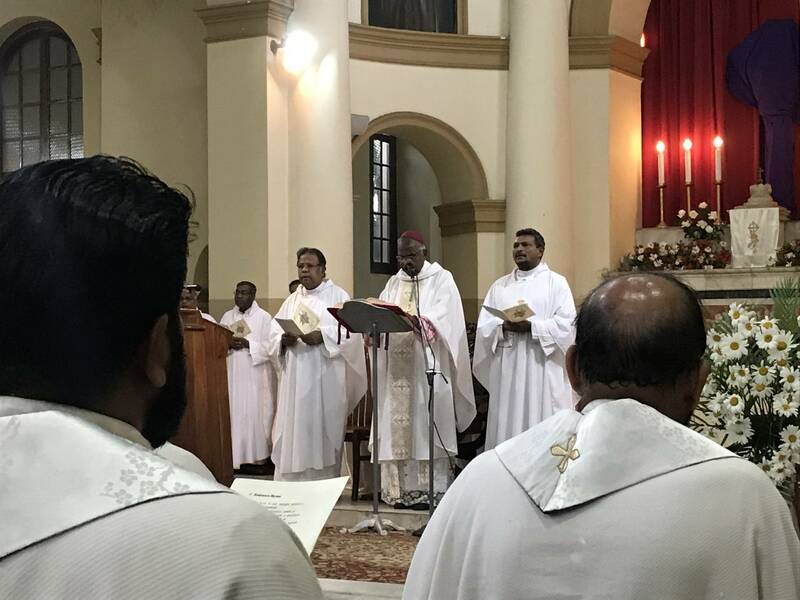 Throughout this year, we are endeavoring to be deeply inspired by the unparalleled missionary zeal and sanctity of St. Joseph Vaz, the beloved Apostle of Sri Lanka. All of us the Laity, Clergy and the Religious have been praying, asking the Lord to help us all to deepen our Baptismal commitment that we may become truly “a participatory and an evangelizing Church”. 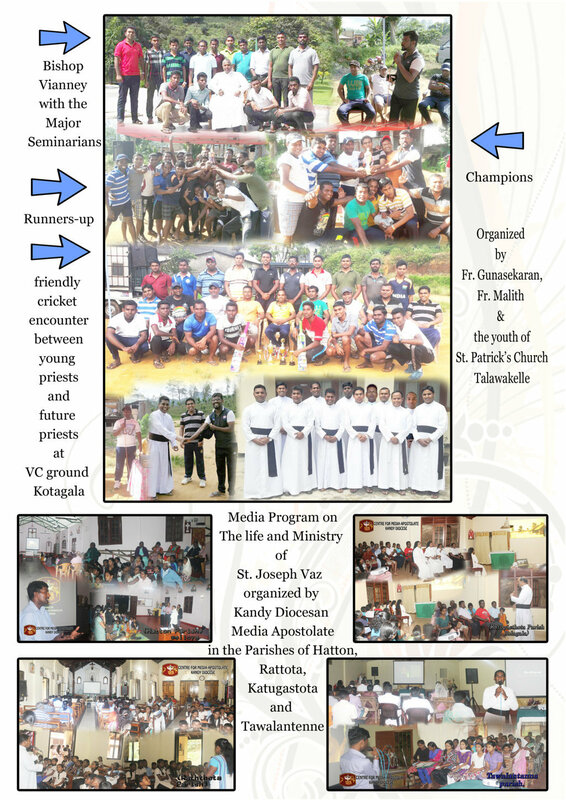 Let us therefore, emphasize with proper preparation, on the need for us to celebrate Mission Sunday meaningfully, in this Year of St. Joseph Vaz. As we have already discussed, at our Presbyteral meeting, we shall make next year an year, to further deepen our faith in view of becoming powerful witnesses to Jesus and the Gospel in all our parishes and in Catholic Institutions. Therefore, it is important to continue to follow in the footsteps of St. Joseph Vaz. In the months ahead all vicariates, parishes and institutions will begin to make their pastoral plans with this vision for 2018. We are also aware that we are celebrating the Centenary of the apparitions of Our Lady at Fatima, this year. Our Blessed Mother repeatedly requested the little Saints Francisco and Jacintha to recite the Rosary with devotion. Francisco was told that he would have to recite many Rosaries before he would go to heaven. It is said that he used to recite as many as eight Rosaries a day. The Holy Rosary though a simple prayer, has been proved to be very effective as our pleading, passes through the immaculate heart of Mary. Let us therefore, implement with great fervour, the “Million Rosaries Programme” launched by the organization of “Aid to the Church in Need”. They are practically the only Catholic organization who at the moment are supporting many pastoral projects and programs in the third world. They are very Catholic in their outlook and vision. 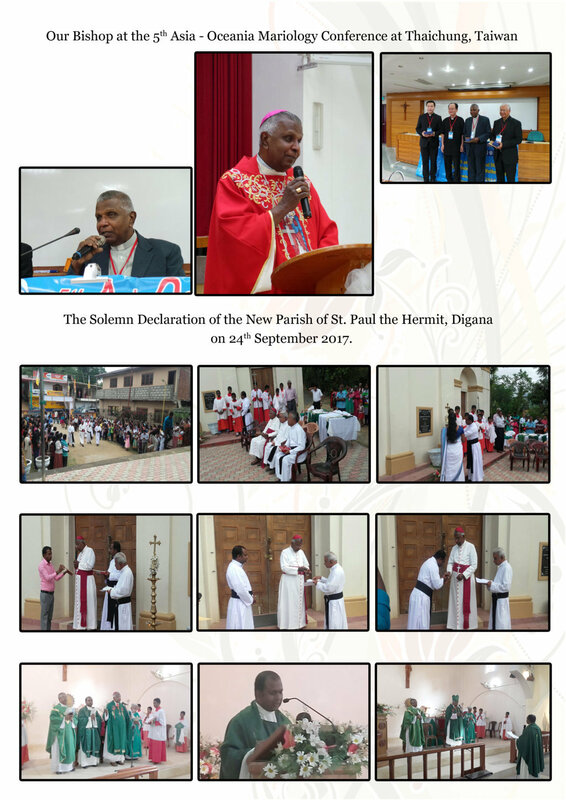 The posters and other literatures have been already circulated to all the parishes. 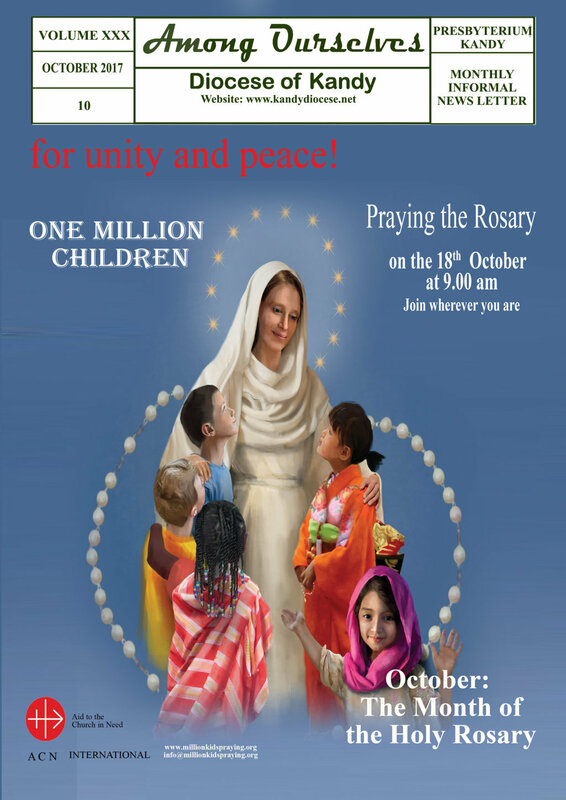 Please make ample use of these materials to encourage all the families to join in the campaign of “One Million Rosaries”, specially in the month of October. The 7th of October is the feast of the Holy Rosary and it is a Saturday. Therefore, please ask your Catechists and Holy Childhood animators to organize common recitation of the Holy Rosary in our Churches and Mission stations specially by our children. Please invite the children and families to pray the Rosary to protect the unborn from being destroyed through abortion. The killing of innocent, unborn is a crime that cries to heaven for vengeance. There will be a Thanksgiving Mass in our Cathedral for the 109 Martyrs of the Claretian Congregation. The Claretians have been very helpful to us in the Diocese by giving us their young priests to help in parishes to assist in pastoral work in many parishes specially when we were greatly handicapped by the shortage of Clergy in the Diocese several decades ago. We are grateful to them for their missionary solidarity even now. 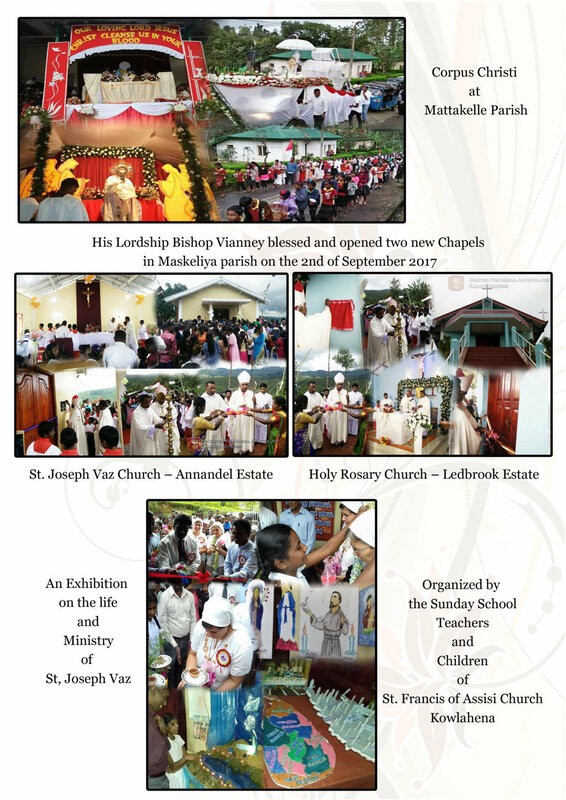 30th 05.00 p.m – A special Holy Mass at Nuwara Eliya 31st 10.00 a.m – Formation Committee meeting at St. Joseph’s Minor Seminary, Poornawatte. the first Bishop of the Diocese of Kurunagala. The Roman Catholic Church has consistently condemned abortion — the direct and purposeful taking of the life of the unborn child. In principle, Catholic Christians believe that all life is sacred from conception until natural death, and the taking of innocent human life, whether born or unborn, is morally wrong. The Church teaches, “Human life is sacred because from its beginning it involves the creative action of God and it remains for ever in a special relationship with the Creator, who is its sole end. God alone is the Lord of life from its beginning until its end: no one can under any circumstance claim for himself the right directly to destroy an innocent human being” (“Donum vitae,” 5). The Old Testament also testifies how God had specially marked individuals for an important role of leadership from the very first moment of their lives: “Beloved of his people, dear to his Maker, dedicated from his mother’s womb, consecrated to the Lord as a prophet, was Samuel, the judge and priest” (Sir 46:13). The prophet Isaiah proclaimed, “Hear me, O coastlands, listen, o distant peoples. The Lord called me from birth, from my mother’s womb He gave me my name. He made of me sharp-edged sword and concealed me in the shadow of His arms. He made me a polished arrow; in His quiver He hid me. You are my servant, He said to me, Israel, through whom I show my glory. Though I thought I had toiled in vain, and for nothing, uselessly spent my strength, yet my reward is with the Lord, my recompense is with my God. For now the Lord has spoken who formed me as His servant from the womb, that Jacob may be brought back to Him and Israel gathered to Him, and I am made glorious in the sight of the Lord, and my God is now my strength!” (Is 49:1-5). Likewise, the prophet Jeremiah recalled, “The word of the Lord came to me thus: Before I formed you in the womb I knew you, before you were born I dedicated you, a prophet to the nations I appointed you” (Jer 1:4-5). Granted, some later rabbinic interpretations allowed exceptions for abortion, but there was no consistent or prevailing justification. The overriding Jewish teaching upheld the sanctity of the life of the unborn child. The Greco-Roman world at the time of our Lord and in which Christianity grew permitted abortion and infanticide. In Roman law, the two acts were really not distinguished because an infant did not have legal status until accepted by the pater familias, the head of the family; until accepted, the infant was a non-person who could be destroyed. In some parts of the Roman Empire, abortion and infanticide were so prevalent that reproduction rates were below the zero-growth level. The story of the visitation further attests to the sanctity of life in the womb and the personhood of the unborn child: “Thereupon Mary set out, proceeding in haste into the hill country to a town of Judah, where she entered Zechariah’s house and greeted Elizabeth. When Elizabeth heard Mary’s greeting, the baby leapt in her womb. Elizabeth was filled with the Holy Spirit, and cried out in a loud voice: ‘Blest are you among women and blest is the fruit of your womb. But who am I that the mother of my Lord should come to me? The moment your greeting sounded in my ears, the baby leapt in my womb for joy. Blest is she who trusted that the Lord’s words to her would be fulfilled’” (Lk 1:39-45). Given the revelation of the Old and New Testaments, with special emphasis on the mystery of the incarnation, the Roman Catholic Church has condemned the practice of abortion. Several examples of teaching which span the first three hundred years of our Church include the following: The “Didache” (“The Teachings of the Twelve Apostles,” c. 80 A.D.) asserted, “You shall not procure abortion. You shall not destroy the newborn child.” The “Epistle of Barnabas” (138) also condemned abortion. Athenagoras (177) in his “A Plea on Behalf of Christians” (a defense against paganism) emphasized that Christians consider as murderers those women who take medicines to procure an abortion; he condemns the killer of children, including those still living in their mother’s womb, “where they are already the object of the care of divine providence.” Tertullian, (197) in his “Apologeticum” likewise asserted, “To prevent birth is anticipated murder; it makes little difference whether one destroys a life already born or does away with it in its nascent stage. The one who will be man is already one.” In the year 300, the Council of Elvira, a local church council in Spain, passed specific legislation condemning abortion (Canon 63). The month of October each year is dedicated to the Most Holy Rosary. This is primarily due to the fact that the liturgical feast of Our Lady of the Rosary is celebrated annually on October 7th. It was instituted to honor the Blessed Virgin Mary in gratitude for the protection that she gives the Church in answer to the praying of the Rosary by the faithful. The practice of dedicating the entire month of October to the Holy Rosary developed toward the end of the last century. Pope Leo XIII ( papacy: 1878-1903 ) strongly promoted the increase of devotion to the Blessed Mother by encouraging the constant use of the Rosary. 2. Those who shall persevere in the recitation of my Rosary will receive signal graces. 6. Whoever recites my Rosary devoutly, reflecting on the mysteries, shall never be overwhelmed by misfortune. He will not experience the anger of God nor will he perish by an unprovided death. The sinner will be converted; the just will persevere in grace and merit eternal life. Message for 2018 World Migrant and Refugee Day, which will be celebrated next January 14th, released. Exhortations and suggestions for a reception that facilitates “personal encounter”. No to expulsion and aptitude. A law that guarantees citizenship in accordance with international rules. The care of minors. Ensure religious freedom for migrants. Aid to developing countries supporting the greatest number of refugees. Push the UN to approve the two global pacts on refugees and migrants. Vatican City (AsiaNews) – The “Church’s concern” for “the sad situation of so many migrants and refugees fleeing wars, persecution, natural disasters and poverty”: This is what has pushed Pope Francis to express His attention to this “sign of the times” in a variety of ways since his visit to Lampedusa in 2013, to establish a “special section” for migrants in the new Dicastery for Integral Human Development. This solicitude – which he wants to share with “all believers and men and women of goodwill”, also urged him to publish today the Message for the World Day of Immigrant and Refugee 2018, to be celebrated next January 14, On “Welcoming, protecting, promoting and integrating migrants and refugees”. The “global” character of the Message is important: it is not only addressed to European or Western countries, but to all countries around the world, recalling that according to UN figures, 84% of refugees find shelter in Turkey (which accommodates 2, 9 million people), Pakistan (1.4 million), Lebanon (over one million), Iran (979,400 migrants), Uganda (940,800) and Ethiopia (761,600). The Message carries the date of August 15, a day devoted to the Solemnity of the Assumption of Mary. The Pontiff recalls that “the Holy Mother of God herself experienced the hardship of exile (Matthew 2:13-15), lovingly accompanied her Son’s journey to Calvary, and now shares eternally his glory. To her maternal intercession we entrust the hopes of all the world’s migrants and refugees and the aspirations of the communities which welcome them, so that, responding to the Lord’s supreme commandment, we may all learn to love the other, the stranger, as ourselves. ” The document addresses the “four verbs” of the theme with exhortations and suggestions. Here the Pontiff proposes ” a series of steps intended to defend the rights and dignity of migrants and refugees, independent of their legal status “: “offering reliable and verified information before departure, and in providing safety from illegal recruitment practices “; ” guaranteeing them adequate consular assistance, the right to personally retain their documents of identification at all times, fair access to justice, the possibility of opening a personal bank account, and a minimum sufficient to live on.” Recalling that the skills and formation of migrants “are a true resource for the communities that welcome them,” he hopes that “in countries of arrival, migrants may be offered freedom of movement, work opportunities, and access to means of communication, out of respect for their dignity “. Particular attention should be given to children who are entitled to “regular access to primary and secondary education” and “temporary custody or foster programmes should be provided for unaccompanied minors and minors separated from their families”. Reiterating the rejection of “statelessness,” he hopes that host countries will adopt “nationality legislation that is in conformity with the fundamental principles of international law” “for young children and those who have lived at length in the country. In this section, the Pope encourages ” a determined effort to promote the social and professional inclusion of migrants and refugees, guaranteeing for all – including those seeking asylum – the possibility of employment, language instruction and active citizenship, together with sufficient information provided in their mother tongue. “; That “all foreigners present in the territory shall be guaranteed the freedom of profession and religious practice”; Humanitarian assistance and aid delivery especially to ” developing countries which receive a significant influx of migrants and refugees” and that “local communities which are vulnerable and facing material hardship, will be included among aid beneficiaries”. In this regard, the Pontiff recalls that “at the United Nations Summit held in New York on 29 September 2016, world leaders clearly expressed their desire to take decisive action in support of migrants and refugees to save their lives and protect their rights, sharing this responsibility on a global level. To this end, the states committed themselves to drafting and approving, before the end of 2018, two Global Compacts, one for refugees and the other for migrants”.